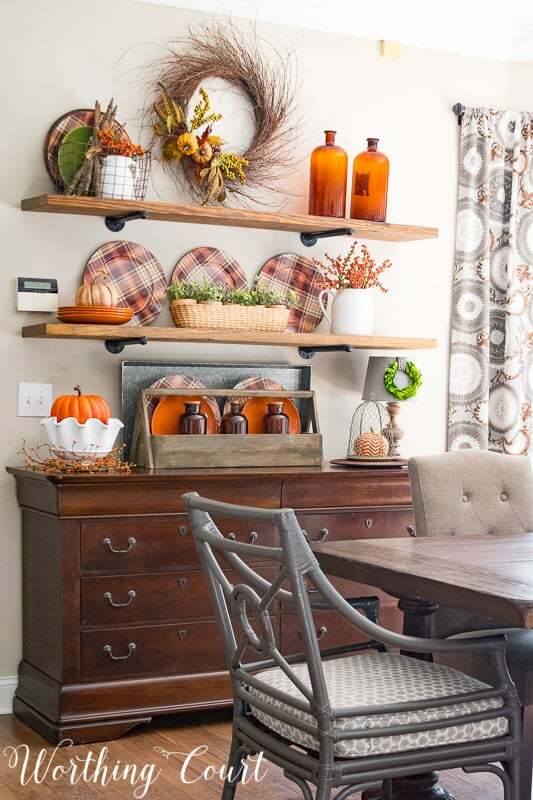 When it comes time to change up our home for the fall season, I may buy a few new pieces, but most of what you’ll see are favorite staples that I reuse year after year! 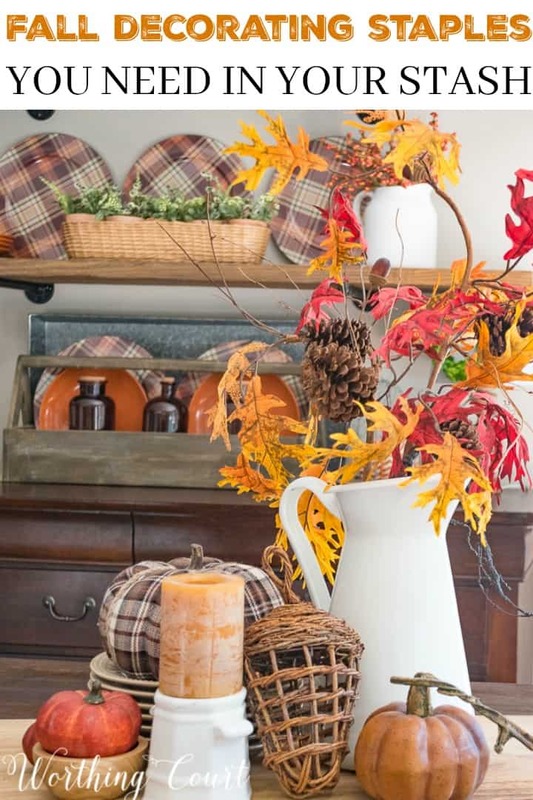 You might think it’s too early to think about decorating for fall, but it’s right around the corner! I’ve been planning my autumn decorations for a few weeks now. 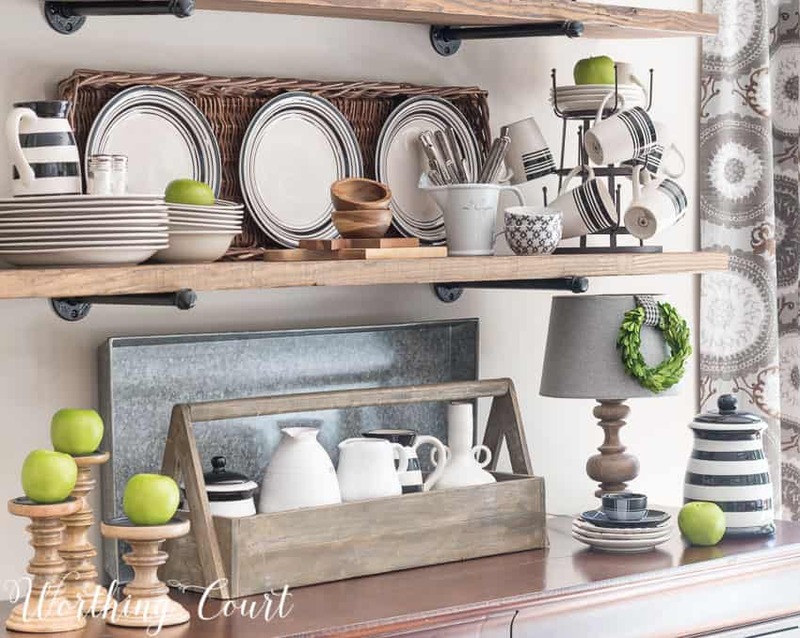 Experience has taught me that having a healthy collection of decorating staples for each season not only challenges me to mix things up each year, but it also keeps my costs down. These are some of my favorite staples to make sure I keep on hand. Give me all the baskets – in every size, shape and color! 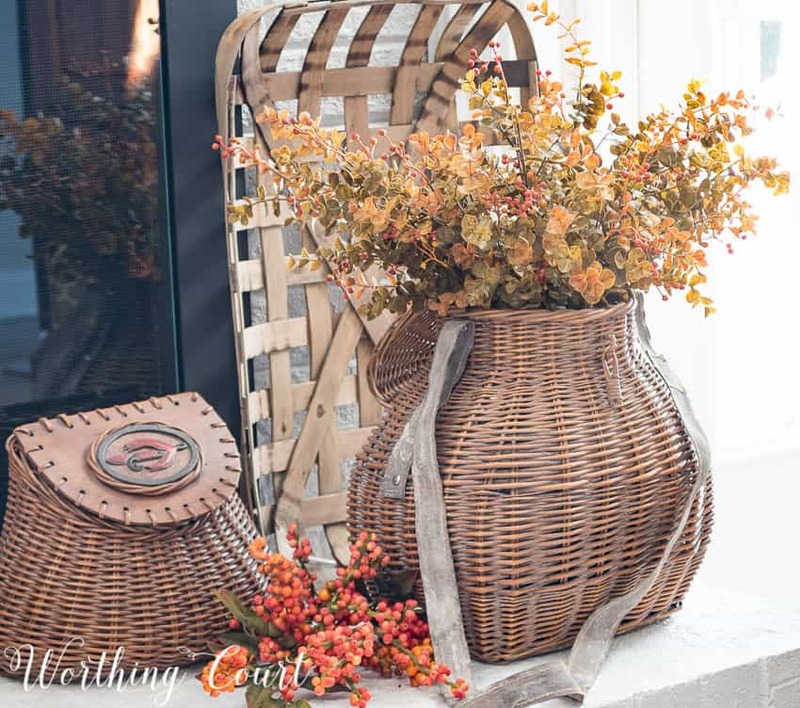 I use baskets year round, no matter the season, but these reproduction, vintage-look fishing baskets seem like a natural fit for displaying on my fireplace in the autumn. The fall foliage and their unique shape makes them a real eye catcher on my hearth. I love displaying both basket sizes together and a tobacco basket leaning against the fireplace makes a great backdrop for them. 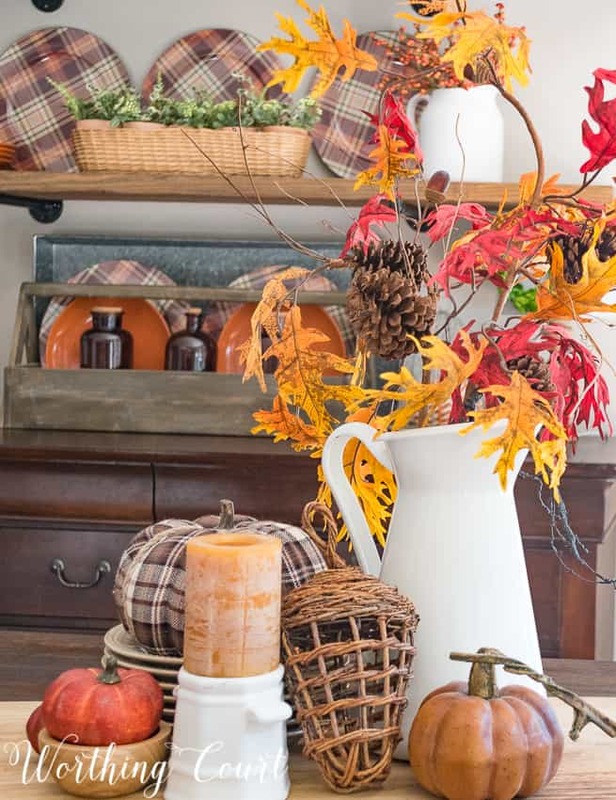 Take a look at the rest of my rustic fall mantel and fireplace HERE. In keeping with the rich brown tones of the wicker baskets, I’m a sucker for garlands of wood beads. They’re so versatile and can be displayed just about anywhere. This strand of beads was made from a container of mixed beads that I purchased at the craft store. All I had to do was to string them onto some fishing line – easy peasy! The varying shapes, colors and sizes of the beads is my favorite thing about this particular garland. Check out the rest of console table and this terrarium display HERE. As much as I love my diy beads, this chunky bead garland that I purchased at Pottery Barn is one of my favorites! They blend with every color and their size adds so much presence, no matter where I use them. Take a closer look at this easy, five minute centerpiece HERE. No matter the variety or color, apples say fall. Did you know that October is National Apple Month? While I love the amber shades of autumn leaves, rustic wood tones and traditional red apples, I also like to liven up my fall decor by adding bright green Granny Smith apples. Whether you prefer the traditional red colored apples or if you prefer green, look for some realistic, good quality artificial ones. I purchased these at Walmart several years ago and have used them over and over as a part of my fall decorations. I’ve had more than one person ask if they’re real! 😀 Take a look at the rest of this fall shelf display HERE. I have a ginormous bin of faux fall foliage that I’ve managed to accumulate over the years. My collection consists of leaf stems, bittersweet picks, feathers and mixed bushes that I often cut apart. Every year when I pull out my stash of fall decorations, I go through all of my foliage and sort it by type, getting rid of anything that didn’t survive to see another year and anything that’s just too dated to use any more. I have a place where I leave it spread out until I’m completely finished with all of my decorating, which makes it super fast and easy to find what I’m looking for. I can’t tell you how many times I’ve skipped that step and wound up buying things that I already had. Plaid isn’t just for Christmas! It’s a classic pattern that never goes out of style and can be used all year long. I have a good variety of fall plaids that I can pull from, but I’m always on the lookout for more. 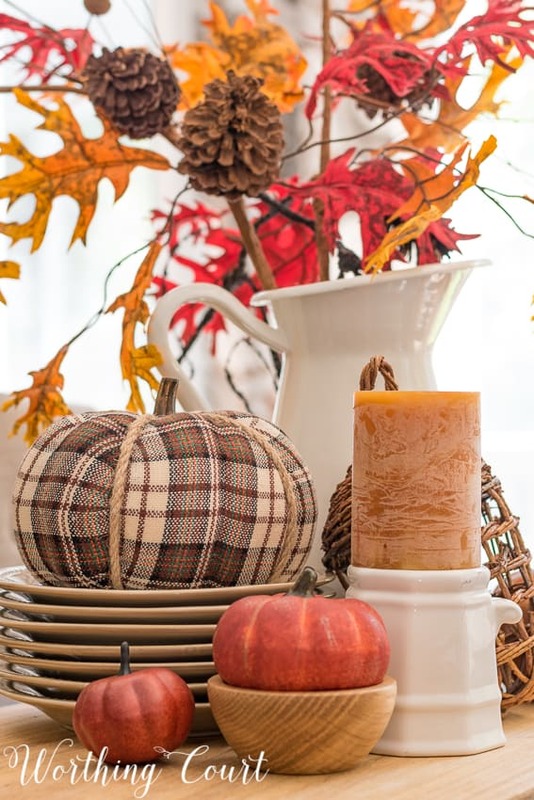 Plaid pumpkins, plaid dishes, plaid charges, plaid ribbon – I love it all! In fact plaid caused me to proclaim that these are my most favorite fall kitchen shelves ever and my opinion hasn’t changed one bit. I can’t wait to pull my plaid chargers and plaid pumpkins out again this year! 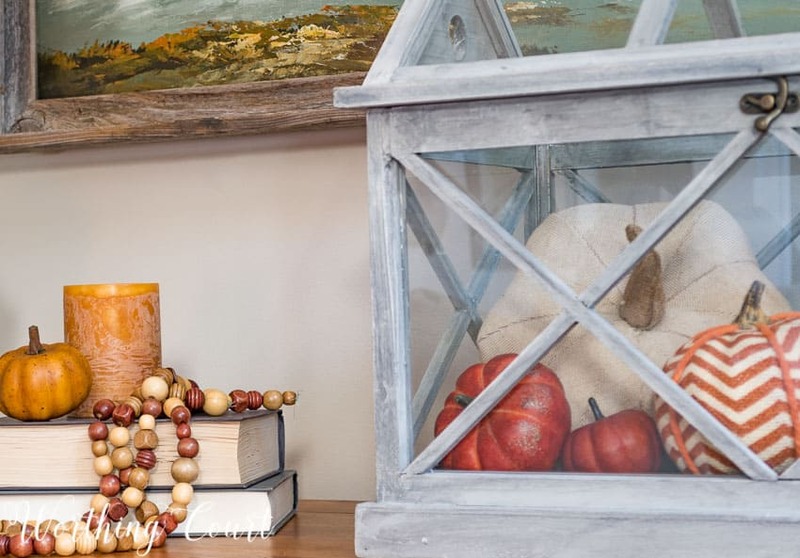 Hopefully, I’ve convinced you to work toward building your own set of fall decorating staples. 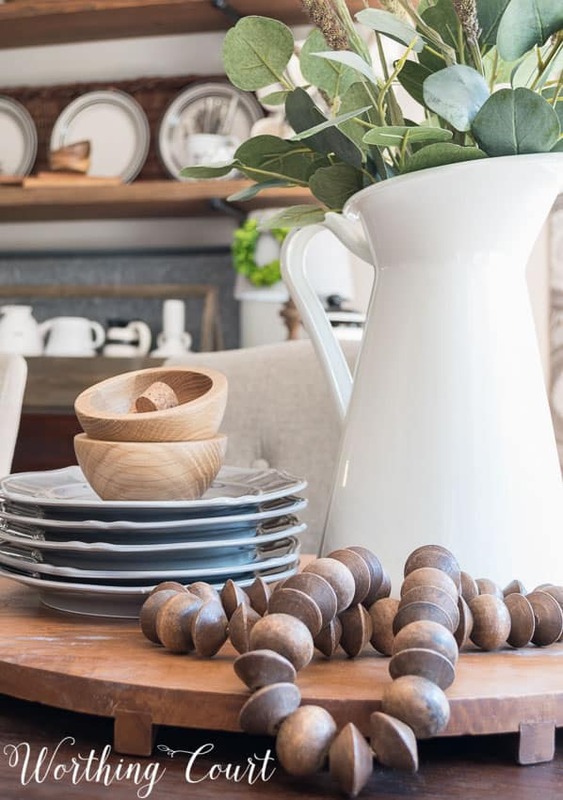 I’m still planning and mulling over our decorations for fall this year, but you can be sure that you’ll be seeing some of these staples making an appearance again in fresh new ways! It’s still just a bit too hot here in South Louisiana to get out my Fall decorations, but I’m looking forward to adding to my Fall stash this year. A trip to Hobby Lobby looms. btw…I just received my little jar of Everything but the Bagel seasoning. Your lunch looked so delicious that I had to try it for myself! Thanks for such a great recommendation. I’m super excited to decorate this year but let me tell you it doesn’t get cool (not cold) here in Arizona until mid October and I just can’t wait that long! I finally FINALLY bought all rubbermaid containers and organized my stash by season! I labeled each one and they are clear! So this year its wayyyyy easier to find all my fall decor ! I love your choice of fall decorations. I really have to go through my stash and weed out things I really don’t use anymore. I have way too many decorations. I don’t know if anyone had this problem but I couldn’t pin any of your photos. I’m sure you are on Pinterest so I will try there. I’m looking forward to decorating for fall soon. I also like plaid and wondered where you purchased your plaid plates or are they chargers? 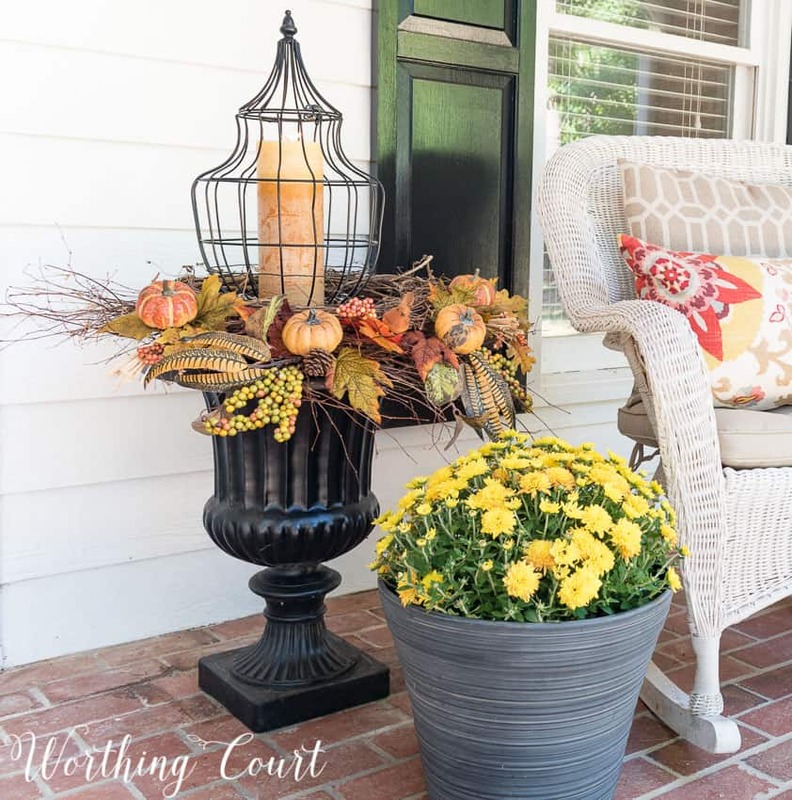 I especially like your fall urn on your porch. This is one idea I plan to incorporate this autumn. I always enjoy your ideas.